How Big Data Will Impact E-commerce Industry in 2018? Whatever happens online and offline, it’s because of DATA. As the technology evolves, the ways to gather and measure data also diversifies. The best way to grasp the data world mechanisms is to study and analyze trends in behavior. Big data is a concentrated accumulation of conventional and digital data from within and outside company operations. The inception of big data has enabled businesses to use huge amounts of data to carry out bigger and more complicated analyses. However, the pressing issue that people face today is that they have “too much” data – collecting, organizing and understanding data has become quite complicated because we now are inundated with ceaseless numbers, percentages, stats, facts and perceptions. 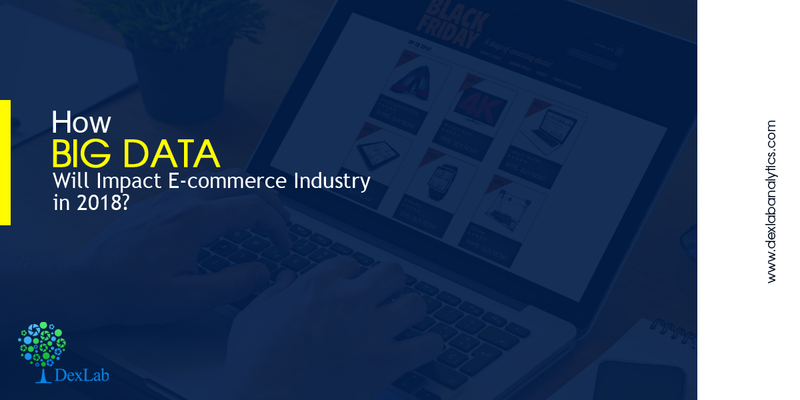 E-commerce industries are the biggest consumers of data. They can extract any information from Big Data and predict customer behavior and streamline robust operations. For online success, understanding shopper’s behavior is more than important. Harness big data; it offers information on trends, customer choices and spikes in demands. It is the key to successful marketing. Throughout this year and more, big data analytics will continue tracking shopper behaviors and fine-tuning your marketing strategies based on that. Figures regarding dissatisfied customers and frail customer service are alarming. Truly speaking, more than 90% of unhappy customers won’t like to do business with a company that has turned their expectations down, owing to poor customer service. Therefore, for ecommerce success, utmost focus on customer service is downright important. This year, expect data analytics to improve customer experience, while giving more focus to predictive monitoring. This will aid companies in identifying crucial issues and resolve them before even a customer gets involved. Since big data came into our lives, several things, like online payments got easier and more secure. How? Big data incorporates various payment functions in a single centralized platform. It helps in making the process easier, as well as reduces fraud risks. The advanced analytics are powerful enough to identify threats and structure proactive solutions to combat potent risks. Big data helps in detecting money laundering transactions. Productive data analytics allows e-commerce chains to cross sell and upsell. Day by day, the use of smartphones is increasing. The use of desktop computers is soon becoming obsolete. Big data is making impossible things possible, especially in the world of smartphones and ecommerce. Companies can now very easily gather data from multiple sources and analyze customer trends through mobile technology. Google has pioneered a wave of technologies, giving preference to mobile friendly and highly responsive sites. They bring in higher traffic to their pages. Hence an instant hit! As closing thoughts, ecommerce companies wholeheartedly thanks Big Data for the way it has simplified the process of online shopping. For more big data inspiration and blogs, follow DexLab Analytics. Our advanced Big Data certification in Delhi NCR is excellent. Hone your skills with big data hadoop training and soar to success.